After the decent days birding in Northamptonshire despite the inclement weather on Saturday, Sunday morning saw us stood in the Cotswold Water Park near Cirencester. It was freezing cold and the wind was whipping across Pit 44, all of the pits here are equally as imaginatively named and distinguished by numbers although the adjacent pits are not 43 or 45 but rather something in the 100's or something, chilling us right to the bone. We had joined another birder or three who were already present, in the search for a small waif of a bird that we normally only see in Cornwall in October. In fact that one that we've only ever seen in the South West before, namely a Yellow-browed Warbler. This particular bird had chosen an area of trees and bushes close to a stream in this part of Gloucestershire just an hour from home. 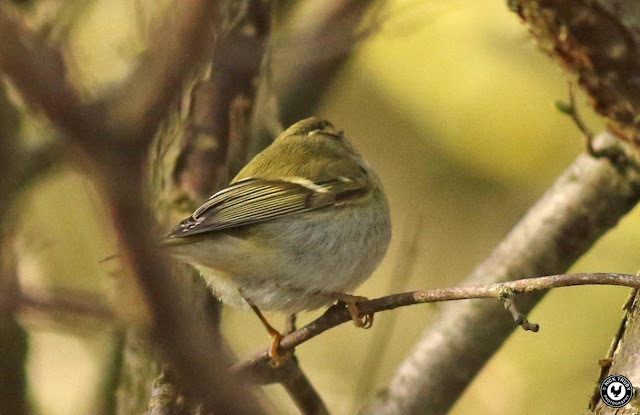 I can't get enough of Yellow-browed Warblers and would quite happily watch them every day so the trip was a no brainer. 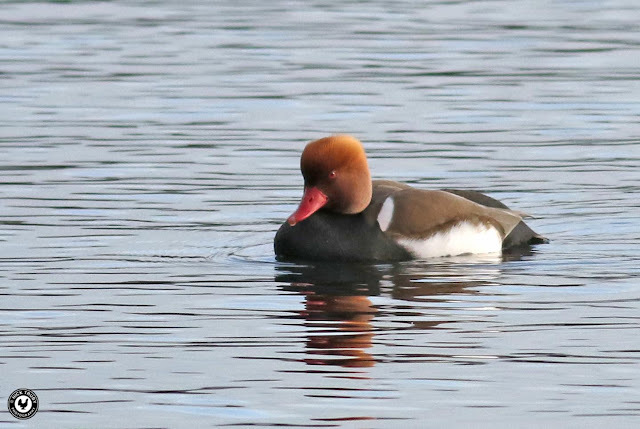 As we had walked along the road that ran alongside Pit 44 we had seen a large group of Red-crested Pochards, both male and females. The drakes are looking resplendent in their freshly acquired breeding plumage and much display was going on. 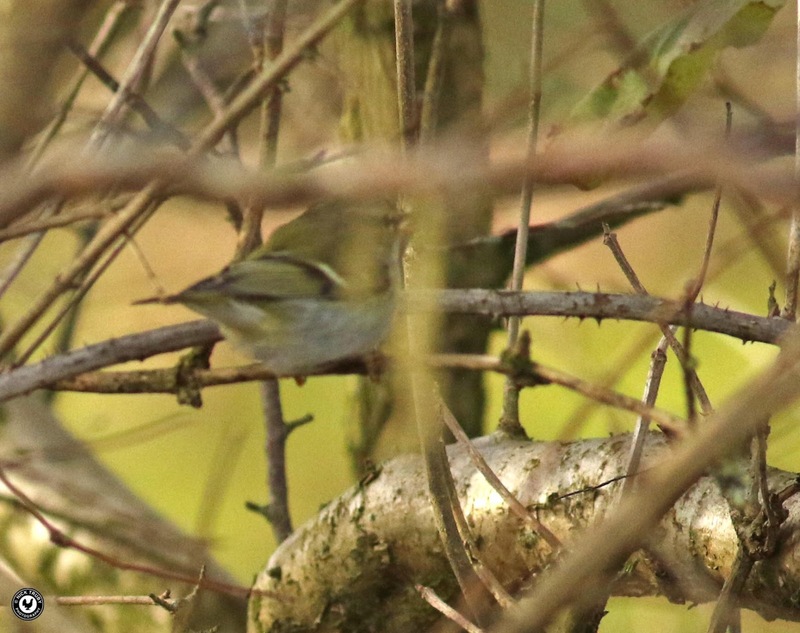 The Yellow-browed Warbler had been seen just ten minutes or so before we arrived in a small tree that was already adorned with catkins so we studied the immediate area around the tree. A fellow watcher gave us the full run down of the birds exact movements and route around the area and then proceeded to look elsewhere 50 yards up the road! I know from experience that birds like the Yellow-browed usually adopt a small area and then systematically move around it in the search for food so it would definitely return to the same spot before too long. When the little sprite flew right over my shoulder from behind me and into the catkin covered tree, there was only myself and Mrs Caley that could see it. By the time the others had reacted to my calls that I had it, the bird had disappeared into a thick bramble bush. They should have stayed in the same place! Mind you the bird was difficult to pin down, as they often are for a photo, and most of my efforts were either blurred or of bits of twigs. It seems my own bad run with the camera was continuing! In my defence though it so bloody cold that I couldn't actually feel any of the buttons and changing settings was slow work. Too slow when trying to chase a quick moving subject like the Yellow-browed. I soon found the bird again moving through the tangle of bushes that bordered another stream that flowed into the one by which we stood. This time I managed to get the other birders on to it and we all enjoyed prolonged views before it disappeared once more. 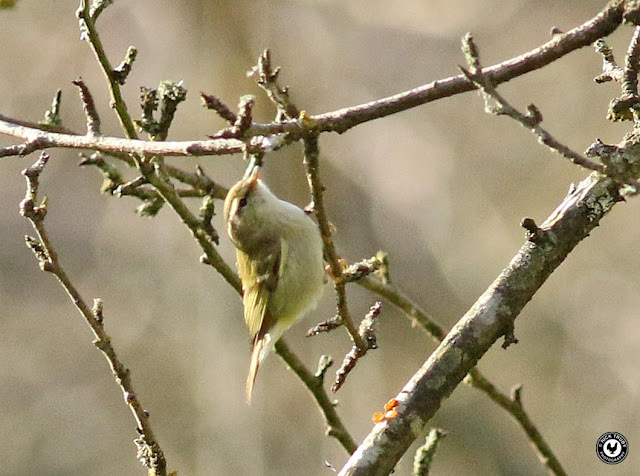 The Yellow-browed soon returned, this time flying into the catkin tree from the bramble thicket. It rapidly moved through and then spent some time in the trees in the orchard behind showing really well as it hunted insects on the outer branches. Only trouble was it was now too far away for any great photos but at least it was easier to track. 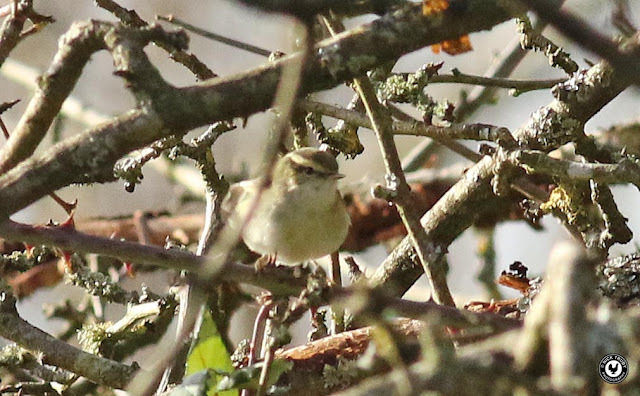 A few moments later the Yellow-browed Warbler was spooked by a Sparrowhawk that flew in rapidly and low through the orchard, making a half-hearted attempt to snare one of the feeding Moorhens In the next hour we never saw the Yellow-browed Warbler again. I studied the Pit over the road once more and counted over 30 Red-crested Pochards and and five Goosanders before we gave in to the cold and headed off to find a local pub and lunch. While enjoying a pretty good Sunday roast in a pub in Ashton Keynes I looked through the bird news and noted that the Yellow-browed Warbler, bird number 104 on the year list, had not been seen again next to the Thames since being spooked by the Sparrowhawk (I hadn't put that news out, one of the others must have). I hadn't realised that the fast flowing stream that the Warbler had chosen as its wintering quarters was in fact the mighty River Thames having completely forgotten that the river that flows wide and deep through Oxfordshire springs as a dribble in this part of the world! Yellow River indeed!! !